It’s an honour to join Martin Garner and the Birding Frontiers Team. My name is Dani López-Velasco, and I am a 25 year old, life-long and very enthusiastic birder, from the northwest coast of Spain. I´ve been very interested in bird ID forever! Seabirding, gulls and rarities have been an important part of my life, the latter mainly after discovering the 3rd Desert Wheatear for Spain when I was 10, and working on the Spanish Rarities Committee since I was 18. I’m also very keen on global birding; South America being my favourite destination. I have recently qualified as a Medical Doctor and also started working as a worldwide bird guide for Birdquest. My contributions will include little known southern European bird subjects, seabirds and my global travels. I hope you enjoy all the team member´s contributions! It is great to join Martin and other members of the team on Birding Frontiers. For me, the great thing about birding is that it can be enjoyed in so many different ways. I have ambled through periods of twitching, patch birding and world listing, and enjoy the birds, the places and the birding scene. I guess like most birders, I have always maintained a core interest in identification. Our knowledge of identification seems to be developing so rapidly that keeping pace can be tricky, but thanks to sites like Frontiers, up-to-date summaries and informed discussion of today’s birding hot potatoes are accessible to us all. Consequently I’m very pleased to be invited to join the team, and hope that I can contribute something useful from time to time. I am a birder and architect living in Arctic Norway’s Varanger Fjord. I run the architectural practice Biotope – and I bird! I work full-time with pro-nature projects in Norway: designing bird hides, wind shelters, nature trails, outdoor amphitheatres, working with local schools and helping tour operators from abroad. I am passionate about making birds and birding accessible to more people. I love living in a place where I wear my binoculars as a tie and I can study Steller´s Eiders from my office window! Arctic Norway is a real frontier and the explorative and open-minded attitude of the Birding Frontiers blog quickly made this a favourite website to visit. I am honoured to join the Birding Frontiers team, and I hope to inspire others, sharing stories of birding adventures and bird related development. I am delighted to be joining the team at Birding Frontiers. I should start by telling you a bit about myself. 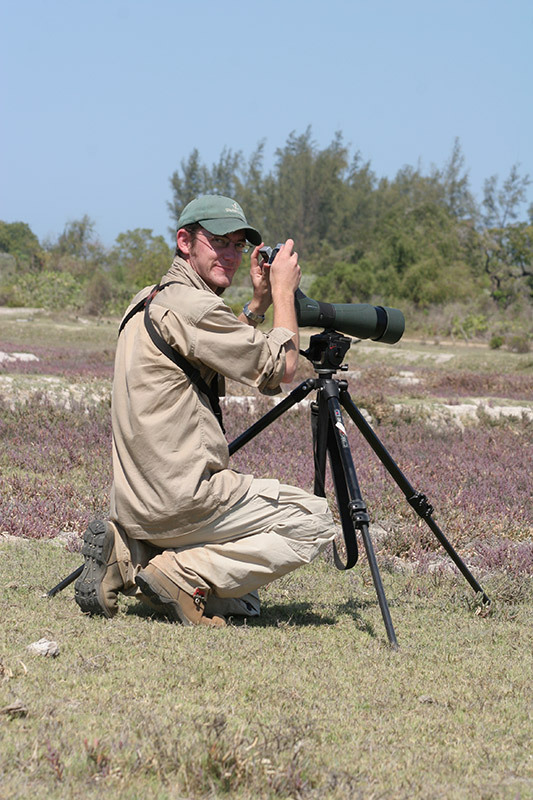 My name is Tristan Reid I am a passionate birder, naturalist, conservationist and father. I run the website The ‘Inked Naturalist’ and co-run the conservation mouth piece ‘Talking-Naturally’. I look forward to the input from other team members and I do have a drive to learn and ask questions. My interests within bird identification are vast, but I like the challenge of tricky groups and I also have a great interest in sub species. I ask a lot of questions, there are not always answers, but this is how we open our mind to learn! I hope you enjoy my contributions and I look forward very much to engaging with you! My name is Sam Jones. I am a young researcher at the start of my career in conservation biology. I have been an avid birder/ornithologist and naturalist for as long as I can remember. I have worked on expedition teams in a number of countries worldwide, including work on some of the least studied species in the world. I have had a long fascination in the frontiers of such work especially in ornithologically unexplored areas. I am also keenly interested in the ethno-zoological conflicts that often drive activities which degrade the environment. My vision is to continue to be involved in pioneering research which mixes the rigour of applied science while making discoveries highly accessible through multimedia. I am currently involved with the Heart of Borneo Project, based in the Murung Raya province of Central Kalimantan, Indonesian Borneo. I am particularly honored and delighted that I will join this great team. I have very much enjoyed the Birding Frontiers blog from the start and it already contains so many interesting items. My contributions will mostly be in line with ID issues. Often it will be ‘work in progress’ and I hope readers will have an input where they can so that together we might come to a better understanding. My focus on bird-ID is of the widest form (but mainly within the Western Palearctic); be it the breeding-type tertial patterns of dabbling duck females or the calls of a Gray’s Grasshopper Warbler: it’s all exciting! Since I come from the Netherlands I think I will sometimes include interesting or funny things from the birding community of this side of the North Sea. I started off birding as an annoying little boy in Hadoram Shirihai’s back seat. Later on I grew up and started finding my own birds. My professional career started as a surveyer, guide, ringer etc. I now work for the Israeli Ornithological Center as National Monitoring and Research coordinator. I have lots of office work but luckily I do lots of fieldwork myself, and I always keep the best atlas boxes to myself and give the rest of my team the remaining birdless boxes ; ). I am very keen on rarities and ID (even gulls! ), and Israel is a great place for both. As a ringer I get to understand moult better: really helpful when identifying birds in the field. I have birded Asia and Africa intensively now married with 2 children. I keep my own blog which keeps me quite busy but I am sure I can contribute to this great team by adding insights from the SE corner of the WP. Paul Lehman currently lives in San Diego California, with previous lengthy stints in Cape May New Jersey, Santa Barbara California, and the New York City areas. His primary interests are in bird identification, distribution, vagrancy, and the effects weather has on bird migration. He loves going to little-known and under-birded migrant and vagrant traps throughout North America and has pioneered much recent field work in autumn in western Alaska, particularly at the village of Gambell, where he has helped to discover nine ‘firsts’ for North America. His keen interest in geography and distribution, coupled with a perverse sickness known as ‘Total Tickies,’ in which he keeps active lists in every state and province in the U.S. and Canada, has propelled him in to almost every nook and cranny in the two countries, and at a wide variety of seasons. He also leads bird tours and has been the chief range-map maker for most of the current North American field guides. I’m extremely thrilled to be offered an invitation to join the Birding Frontiers Team. I’ve been Birding since I was 8 years old and became seriously interested in Moths & Butterflies some 15 years ago. I run a website called Simply Birds and Moths that offers a point of reference for the Moths of Derbyshire and the Butterflies of Britain. I became fascinated in moths and their incredible migration during many visits to the Isles of Scilly. I’ve also spent the last 3 or 4 years photographing our British butterflies. My other interests are photography, a nice drop of beer and playing my acoustic guitar. I’ve also been married to Helen, my wonderful wife, for 35 years. I am very much looking forward to shared learning and discoveries and hopefully help inspire others to enjoy the world of Birds, Moths & Butterflies. When I was 6 my fathers used to bring me out in the nature. Thanks to my fantastic parents, I was studying birds but also dragonfly, reptiles and wildlife in general. Now I love to read novels, go for music concerts and visit museums but still 80% of my life is devoted to birds and zoology, either field trips, museum skins studies, researches and so on. I have published a lot, not always so good reading them again now but always a step to start and go further: this is for me what science should be – a never ending learning process! I study raptors mostly, shorebirds and in general birds of the Mediterranean region, North Africa and the Middle East. What I love more is to go to the little paradise of Linosa Island, Sicily, with my best friends and members of the birding team “the MISC”. This is how life should be- simply perfect and peaceful! A birder since childhood I have always loved my local patch. The local sugar-beet ponds, gave way the Wadden Sea but my real favourite is and has always been Helgoland. In March 2012 a dream became true when I became the technical director of the ringing station. Helgoland is probably the only place in Germany most birders in the world have heard of – be it for the tunnel traps, the spectacular bird migration or the vagrants. The exciting thing living there is that every day is different! And any day you can expect the unexpected: a vagrant from far away, a non-migratory bird from the mainland or just an odd-coloured or odd-calling bird. These birds actually make bird identification thrilling for me! I am also a biologist who has worked in various bird related projects. Although I traveled to many countries, my favourite destination remains the Russian Arctic. I’m very happy to join the team of BF. I began as a ringer at 12 years old in 1981 in Tiana, near Barcelona. From that time I’ve been involved in ringing projects, evolving from regular ringing to present focus on selected species for specific research. Nowadays I combine expeditions within the Western Palearctic (in-hand bird studies, sound-recording and museum studies) with a deep interest in ID of birds of the world, travelling as well as studying pictures and literature. I’ve been working on HBW (Handbook of the Birds of the World) since 2002, and the Handbook of Western Palearctic Birds from 2008. One of my regular jobs is the checking of scientific literature for the HBW Alive project, so my contributions will be along the lines of news and comment on academic literature dealing with such as taxonomy and range. I’ve been birding since I was a kid and digiscoping since the late nineties I began using a camcorder to record the birds I was seeing, but quickly graduated to a Nikon Coolpix. The rest, as they say, is history. I now use a Nikon V1, Swarovski ATS 80 HD, and either the 20-60x, 30x, or 20x eyepieces, and various adapters. I am certainly more a ‘birder who digiscopes’, rather than a ‘bird photographer’, so understand that not everyone spends hours waiting for the perfect shot. I have however, also been know to do that too! I spend most of my time birding in Bedfordshire (where I am the County Recorder), with the occasional trip abroad to remind me what real birds are like. Great to be part of the Birding Frontiers team! I have been married to Sharon for 22 years and we have 2 teenage daughters, Emily and Abigail who are in near-adult plumage. I’ve been watching wildlife avidly since about 11 years old (a long time ago!). I love wild places and new discoveries, whether on a far-flung island or in my own garden. I started ‘Birding Frontiers’ as a place to share what I was learning and hopefully inspire others to do the same.